Your Free Shipping offer will be applied automatically at checkout on Rock- It Creations's website. All engraved rocks are NOT created equal! 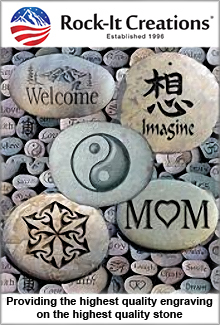 Top-quality engraved stones from the Rock- It Creations catalog make wonderfully unique gifts, garden decorations, pet grave markers, memorials and welcome signs with big coupon code savings. A truly unusual gift idea, an artistically engraved natural stone deeply touches people. Be assured that Rock-It Creations takes the necessary time and care to assure that their products will look beautiful and stand the test of time.